The Chairman of the PCA, Mr Harold Scruby, today called on the NSW Minister for Roads and Transport, the Hon Carl Scully, to immediately introduce a minimum of three demerit points for motorists who stop their vehicles in pedestrian zones. “But the most glaring omission had been that there was no reference whatsoever to the introduction of demerit points for motorists who stop on or before pedestrian crossings. This is utterly unacceptable as the committee had received many submissions from highly respectable organisations calling for such a law. Mr Scruby added: “It is utterly absurd and totally inconsistent that this Government, which is committed to the safest roads in the world, can possibly support 3 demerit points for travelling in a bus-lane, where there may be inconvenience but where absolutely nobody’s safety is compromised, yet continue to ignore this vital safety initiative. This proposal will cost nothing more than Mr Scully’s signature on the Regulation. “And is it any wonder that the NRMA has just discovered that over 70% of motorists speed through schoolzones? Enforcement is an utter farce, with the Police Commissioner placing ten times the importance on burglary than the lives and limbs of our most important asset, our children. “The PCA implores Minister Scully to avoid another Bulli and act now . And the PCA implores the RTA to install fixed speed cameras at all school zones throughout the state. Money is NOT the issue. They will more than pay for themselves through fines and the huge savings in hospital admissions.” Mr Scruby said. An Auditor-General's report released in November found that the State Government's parking police, who began operating in 1945, were inefficient. The LGA submission said councils should control parking - citing the example of the country town of Scone which only had one parking police enforcement carried out In the past year. 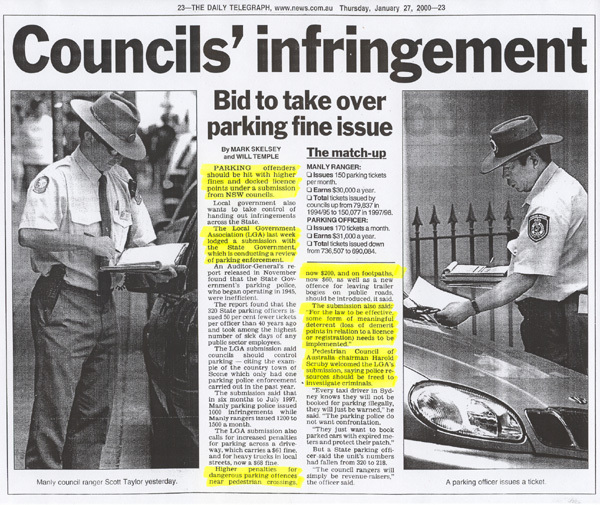 The submission said that in six months to July 1997, Manly parking police issued 1000 infringements while Manly rangers issued 1500 a month. Higher penalties for dangerous parking offences near pedestrian crossings, now $200, and on footpaths, now $60, as well as a new offence for leaving trailer bogies on public roads, should be introduced, it said. The submission also said: "For the law to be effective, some form of meaningful deterrent (loss of demerit points in relation to a licence or registration) needs to be implemented." Pedestrian Council of Australia chairman Harold Scruby welcomed the LGA's submission, saying police resources should be freed to investigate criminals. "Every taxi driver in Sydney knows they will not be booked for parking Illegally, they will just be warned," he said. "The parking police do not want confrontation. "They just want to book parked cars with expired meters and protect their patch." But a State parking officer said the unit's numbers had fallen from 320 to 218. "The council rangers will simply be revenue raisers," the officer said. 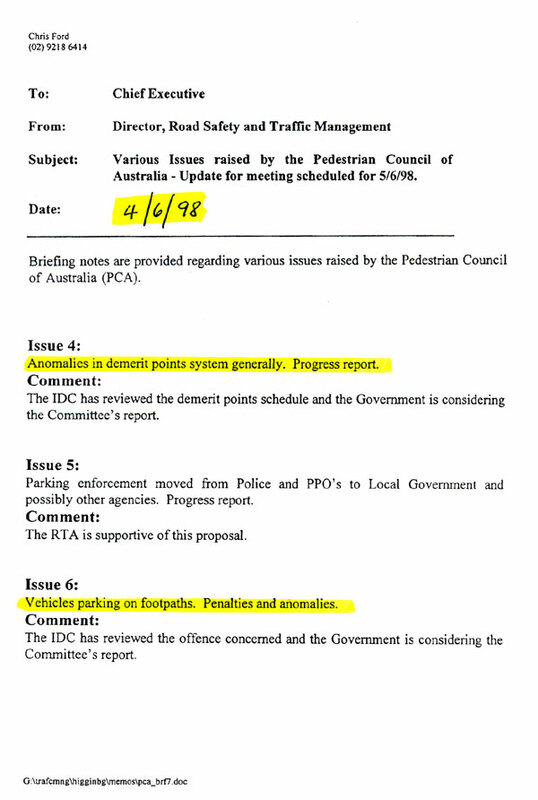 For many years, the PCA lobbied both the RTA and Roads Minister Carl Scully to include demerit points for the offence of stopping in Pedestrian Zones. To date, in spite of all the evidence and the overwhelming support from a wide variety of stakeholders, we have been unsuccessful. To his credit and in response to our requests, he did create a new Regulation/Offence and increase the penalty for stopping in Pedestrian Zones from $147 to $220. However, this new offence has been left largely unenforceable because all the Council Rangers and Council Law Enforcement Officers (CLEOs) have been told and trained that they must always (quote) "GO BY THE SIGNS". In the past, most Pedestrian Zones were surrounded by "No Standing" signs. Under the old law, this allowed motorists to stop and set down or pick up passengers. The law and the signs will continue to have legal effect until the end of 2006. The law and signs therefore "invite" motorists to stop and park for as long as they like (the legislation is silent on time) if they are engaged in picking up or setting down passengers. It is extremely dangerous behaviour. Vehicles stopped in these locations obstruct the vision between motorists and pedestrians. There is no limitation on size and vehicles as large as pantechnicons can legally stop and park in these locations, right across the pedestrian crossing itself. While the PCA continues to lobby both the RTA and Local Councils to install the new signs as soon as possible, well over half of the NSW parking signs surrounding Pedestrian Zones remain old and potentially lethal. To add insult to injury, most Rangers and CLEOs will not issue the $220 fine where there are No Stopping signs because they have been instructed to "GO BY THE SIGNS". 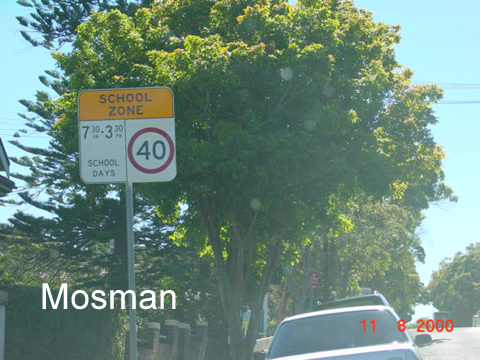 As it is legal to stop and park in Pedestrian Zones with the old No Standing signs (if the driver is picking up or setting down passengers) and because of the abovementioned instruction given to enforcement officers regarding the new "No Stopping" signs, Mr Scully's Regulation and $220 penalty have becoming largely unenforced. The vast majority of officers issue the $147 penalty. 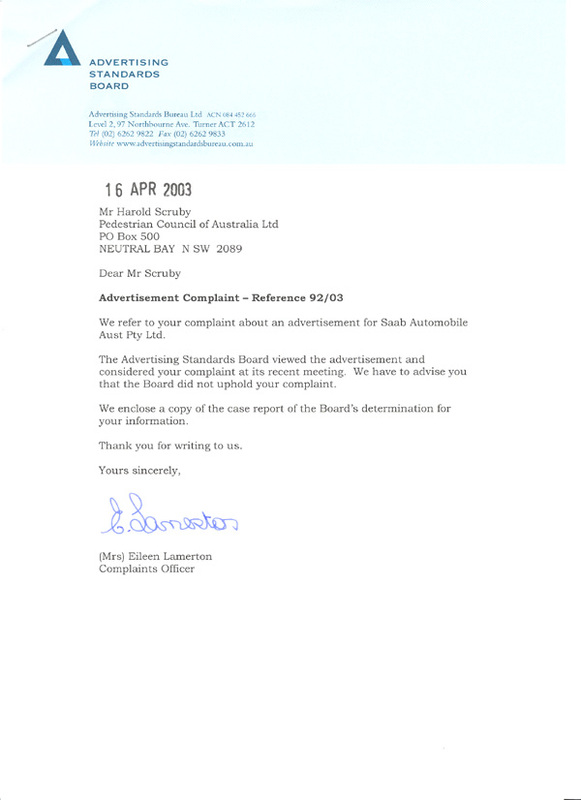 When we wrote and pointed out this anomaly to Mr Scully, we received the above reply (undated but about February 2002) from Parliamentary Secretary, Reba Meagher who stated: "It is a matter for the enforcement agencies to determine which penalty notice is issued ..."
This reply is utterly unacceptable. Laws should be clear, concise and unambiguous. Motorists should know which penalties apply to certain offences. No laws should permit discrimination which this law clearly allows. And it should not be up to enforcement officers to decide which penalty they feel like issuing on the day. Mr Scully obviously introduced the higher penalty in order to deter motorists from stopping in Pedestrian Zones and to reduce the number of motorists stopping in these locations. That was his intention and the intention of the NSW Parliament. 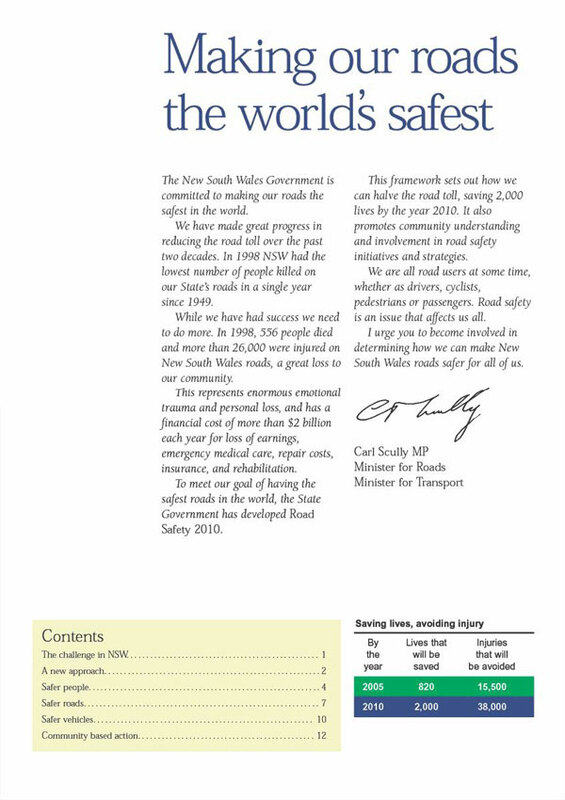 In 1999, Mr Scully and the RTA formally committed to "2010 - The Safest Roads in the World". This commitment included saving 2,000 lives by 2010 and 820 lives by 2005 (see commitments below). To date there have been fewer than a handful of lives saved. To date Mr Scully has done nothing to correct his potentially error. It is extremely difficult to imagine just how Mr Scully and the RTA intend to meet these "life and limb saving commitments" when this culture of apathy and pass-the-parcel is permitted to prevail. The following recommendations are designed to improve the efficiency and effectiveness of enforcement, fine collection and the public understanding of the law applicable to parking. •	the identification of opportunities to improve settlement of fines due. •	fines for parking and traffic offences committed by drivers domiciled overseas (in the use of rental vehicles while in Australia) be enforced via credit card payment either by an “on the spot” fine or by the rental company collecting penalties subsequent to the offence. •	public education campaigns be undertaken of the law by responsible agencies. Currently a potentially dangerous parking offence does not attract demerit points (in terms of the driver’s capacity to retain his/her driver’s licence). Demerit points are primarily associated with traffic offences, that is “moving” vehicles, for example, speeding. •	stand (park) on a bus stop, stand or zone situated on a Clearway, Transit Lane, Bus Lane or Buses Only Lane. The proposal was subsequently withdrawn. The introduction of demerit points for certain offences, for example, parking in No Stopping zones or Clearways, seems to have merit. It may be worthy of consideration in situations of employees committing offences in the conduct of commerce on behalf of their employer in the knowledge that the employer will pay the fine. Conclusion: There are a number of enforcement alternatives used in other states which could be considered (or reconsidered) for use in NSW to improve compliance with law.